and today’s topic is Christmas Traditions. 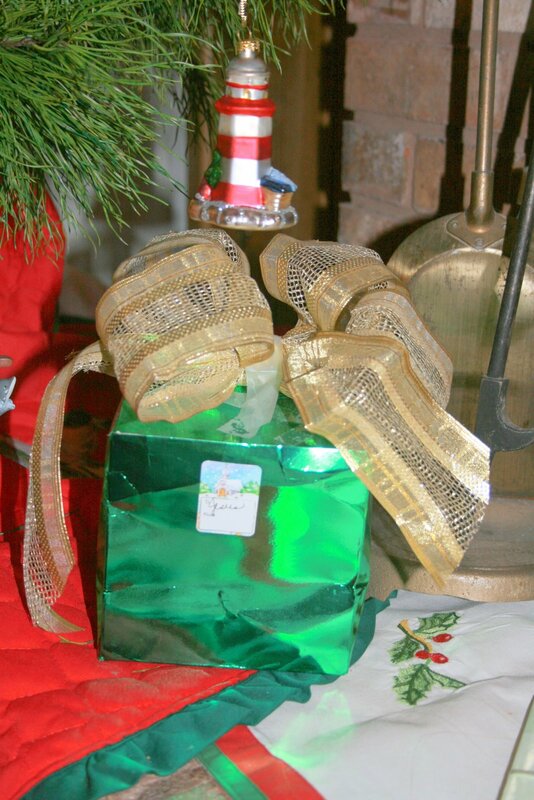 And rather than write a whole new post, I thought I’ll look for one previously written that speaks of the Green Box – One of Two of my favorite Christmas Traditions. And so below you will find a copy and paste of an older post, originally written December 17, 2003 and updated December 17, 2007. I hope you enjoy it. You may also click HERE and read the entire post. This morning, in my early thoughts, came the Scripture “I have been young now am old” and, of course, I did not know the reference for it but I found it. Psalm 37:25: I have been young and now am old, yet have I not seen the [uncompromisingly] righteous forsaken or their seed begging bread. But that is not all that is in Psalm 37. Psalm 37 is one of my most favorite passages. Psalm 37 begins with Fret not yourself and that is a very good place to start each morning to Fret not yourself even if we have been young and now am old. So what is this talk about having been young and now am old? It is a “back door” to tell you that I am 52 today and am tickled to say it. I remember when I turned 40; I was very much out of fellowship with My Jesus at that time and turning 40 was not pretty… Talk about a brat! I was ONE!! But those days are passed and praise be to My Jesus I am excited today!! Taking a good look at myself, where I am, who I have in my life and Jesus TOO! I am blessed beyond measure!! When I was a child having my birthday so close to Christmas was not the joy of my life but I have changed my mind… Sharing my birthday (month) with Jesus …. 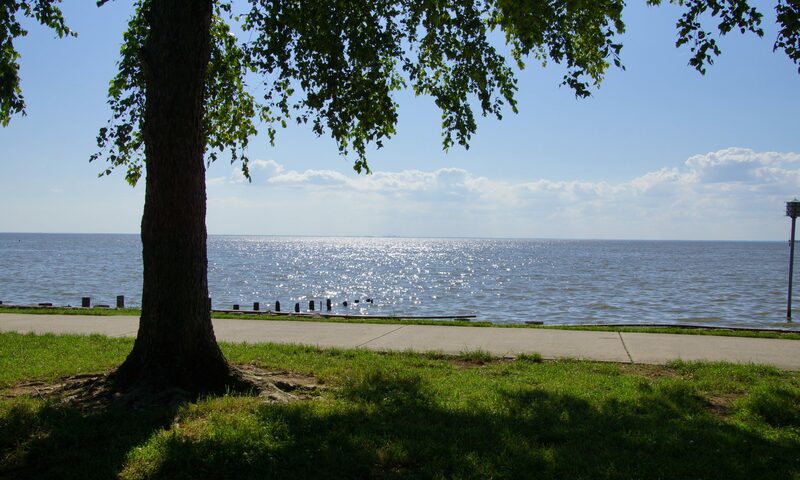 Nothing could be better! And to add to my delight, my Christmas tree is up, the lights are on and that little green box with the gold bow is sitting beneath the tree just waiting for my girls and me to place within it another prayer; another gift to Jesus this year. Last year was Bethany’s first year to place a gift in the box. We talked about the box the other day and she is excited to “write” her gift this year. FATHER IS SO GOOD!! 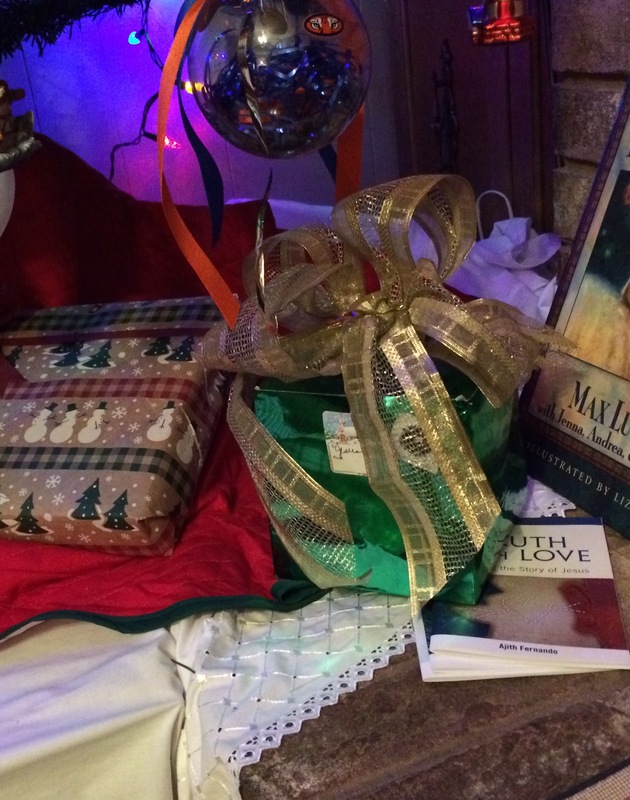 Placing a gift box under my tree bearing the name of JESUS is a fairly new tradition in my family but it is one we treasure. My appreciation for “Christmas traditions” that honor Jesus grows and grows as I see my girls embrace those traditions for their homes. And you know what… It is never too late to start! I also have another tradition for my tree and I was particularly blessed this year when I saw my Baby Girl’s tree; because there it was right there on top just like on her Momma’s tree was THE DOVE. 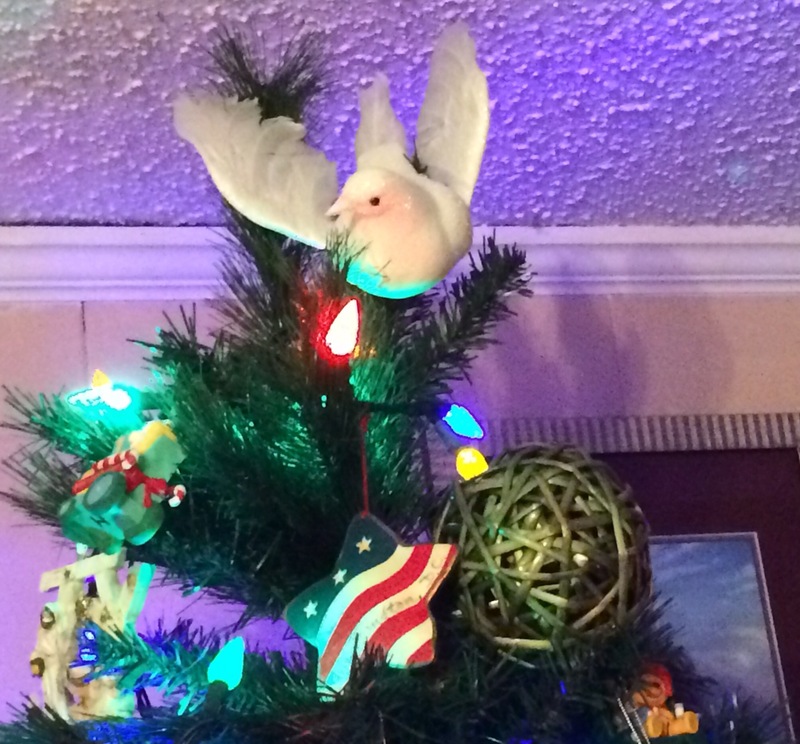 Yes, the top of my tree holds a DOVE. Why? And when Jesus was baptized, He went up at once out of the water; and behold, the heavens were opened, and he [John] saw the Spirit of God descending like a dove and alighting upon Him. The Dove atop my tree is there in honor and to say THANK YOU to the HOLY SPIRIT OF GOD who imparts the LIVING CHRIST to my Christmas, to my home, to my life AND HE IS SO WELCOME. So there you have some of my Christmas Traditions … Yes, sharing my birthday (month) with Jesus is sweet indeed! But back to Psalm 37. If you have not read the entire chapter lately, today would be a good day. It contains comfort and strength and it is just a delight to read. Particularly: Trust (lean on, rely on, and be confident) in the Lord and do good; so shall you dwell in the land and feed surely on His faithfulness, and truly you shall be fed. Delight yourself also in the Lord, and He will give you the desires and secret petitions of your heart. Commit your way to the Lord [roll and repose each care of your load on Him]; trust (lean on, rely on, and be confident) also in Him and He will bring it to pass. One point that struck me with that verse and I will close for today… Trust in the Lord and do good … Doing good alone is not enough… It is the trusting the Lord that makes the doing good count. And now it’s 2007, The DOVE has a home atop the Thompson Christmas tree and the Green Box with the Gold Bow sits beneath, waiting. The home-place of Christmas celebrations has changed for me since 2003 but Jesus remains. 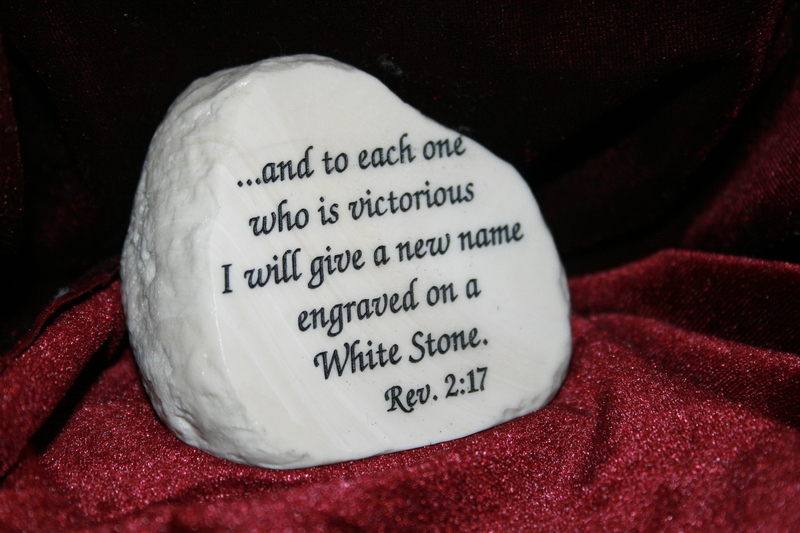 Hallelujah!Hebrews 13: 8 Jesus Christ the same yesterday, and to day, and for ever. He’s still trustworthy, still interceding for His Own and still saving the lost who cry out to Him!! Day 350 of 2014, a day to give Thanks! Thank you so much for sharing this with us. Psalm 37 is one of my favorites and it was good to re-read it today. I love the box and the dove ideas…hmm…good things to ponder! What a VERY COOL IDEA! I love it. It is a treasure box, for sure. 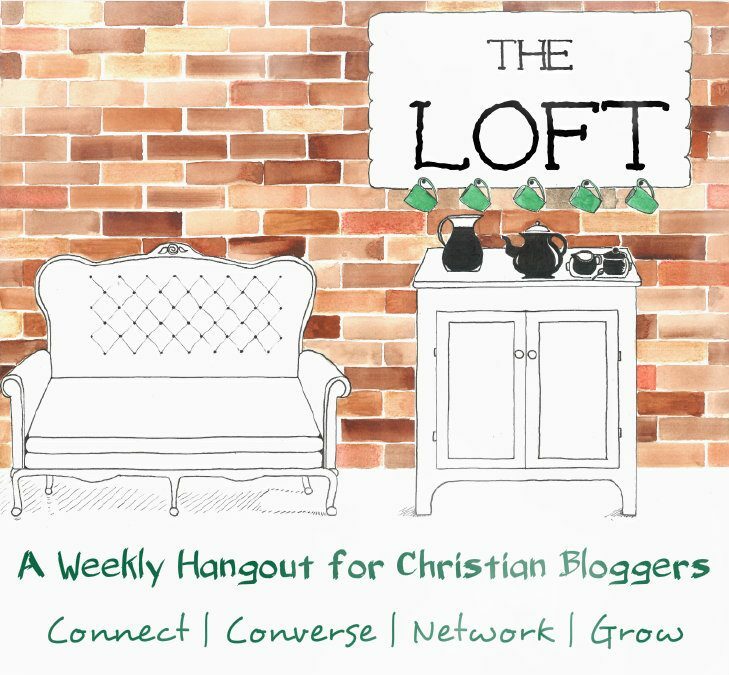 Thank you so much for sharing it with us at #theloft. I bet a few moms of young ‘uns will pick up on that idea and run with it. I know I would if I had little ones around. And I am so, so thankful! So, you write prayers and put them in the green box for Jesus? What a great tradition. I love it! Yes. Started that tradition in 2000. For a few years only my prayers went into the box but now there are prayers in that box from daughters and grandchildren and even a friend who spent Christmas Day with us a couple or so years back. That Little Green Box holds stories of loss and victory, praise and cries for help and words of adoration and thanksgiving. I sometimes go back and read my own; I resist reading the others – although I’ve been told I can. 🙂 Thank you for visiting with me, Karen.